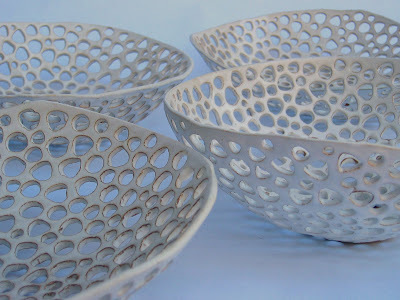 I'm so taken with these perforated bowls by Philadelphia ceramist and Etsy seller Chloe Le Pichon. Each bowl is hand-thrown on the potter's wheel before Le Pichon carves out the holes, creating something that's both substantial and ethereal. 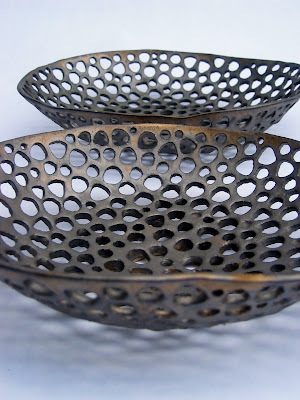 The 3-by-9.5-inch decorative bowls are $55 each, and are available in a golden black glaze as well. See all of Le Pichon's beautiful ceramics right here. those are gorgeous and cast lovely shadows. thanks for showing! those are awesome. Thanks for sharing. I might never have seen this great etsy seller if it wasn't for your post! They are so cool. Thanks for finding them.